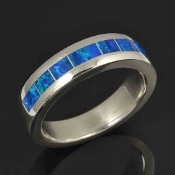 We invite you to browse through our large selection of dinosaur bone rings, turquoise engagement rings, lab created opal jewelry, and unique wedding sets. 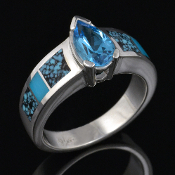 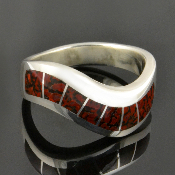 Our handcrafted jewelry is known for its superior craftsmanship, bold designs and top of the line materials. 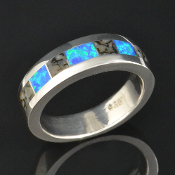 Some of the stones we inlay in our jewelry include lab created opal, dinosaur bone, sugilite, turquoise, lapis and black onyx. 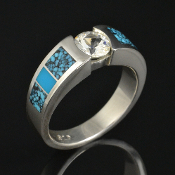 Our inlay jewelry color combinations are endless, so if you don't see the exact inlay color combination you are looking for, just ask for a custom quote. 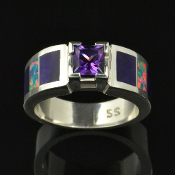 We would be happy to create a unique custom piece of handmade inlay jewelry just for you. 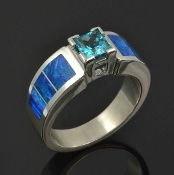 If you are looking for a unique handmade wedding ring or engagement ring that separates you from the crowd, you have come to the right place. 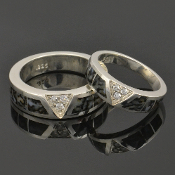 We offer wedding ring sets in his and hers, hers and hers, and his and his ring combinations. 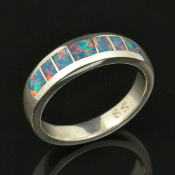 Our distinctive and colorful inlay wedding ring designs can be customized to reflect your unique personality. 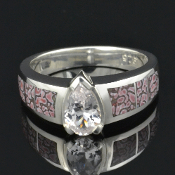 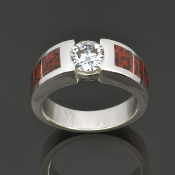 All of our ring designs will be made to order in your specific ring size in 4 to 6 weeks. 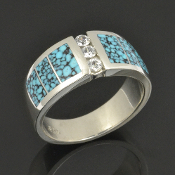 Most of our sterling silver jewelry designs are available in 14 karat yellow or white gold as well as stainless steel and platinum. 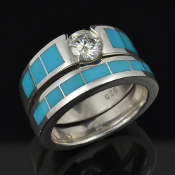 Contact us with your ring size for a quote. 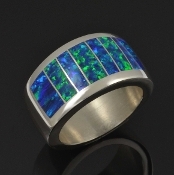 Don't forget to stop by and check out our Australian opal and 14 karat gold jewelry designs at TheHilemanCollection.com. 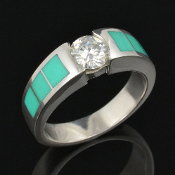 Handmade chrysoprase inlay ring with white sapphires set in sterling silver. 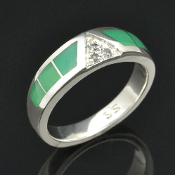 Three pieces of chrysoprase are inlaid in each side of this ring with 3 pave` set white sapphires in the center. 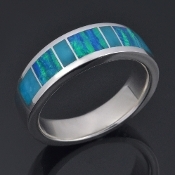 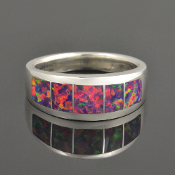 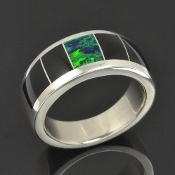 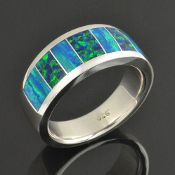 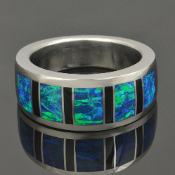 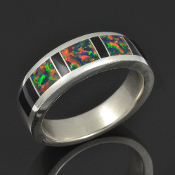 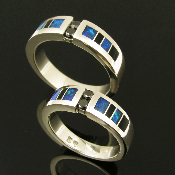 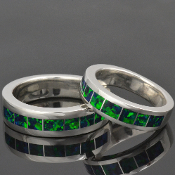 Dazzling laboratory grown opal ring inlaid with 7 pieces of multicolor opal in a sterling silver band. 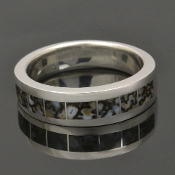 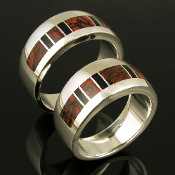 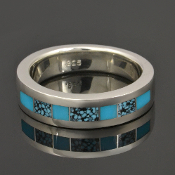 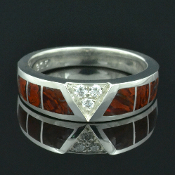 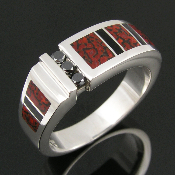 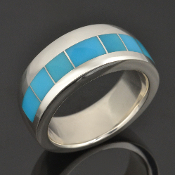 The majority of our inlay ring designs are made to order in your ring size. 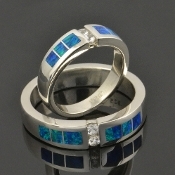 The photos you see are of the original sample ring, pendant, bracelet or earrings which most likely has been sold. 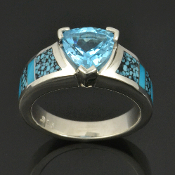 Your new jewelry will be made to order with the same materials as shown in the photos in 4 to 6 weeks. 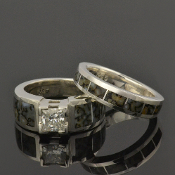 We will need your exact ring size for your new ring. 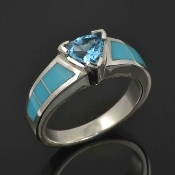 Read our finger sizing guide before ordering. 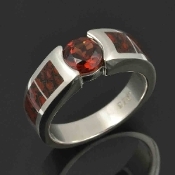 Please allow 3 to 5 days for shipping time as well. 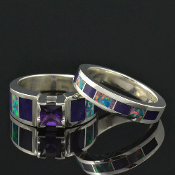 Mark or John are happy to answer all your questions or take your order by phone at (623) 518-6588 or (623) 518-6590.